PRODUCT DESCRIPTION: This product is delivered in an aerosol much like hair spray and has no odor. It used pyrethrin as the active ingredient which is very safe. Pyrethrin is extracted from the chrysanthemum flower and is very active against many pests. It is unique in that it will both kill and repel most any insect. TARGET PESTS: Angoumois Grain Moths, Ants, Bees, Beetles, Cadelles, Centipedes, Chiggers, Cigarette Beetles, Clothes Moths, Cockroaches, Confused Flour Beetles, Crickets, Dermestid Beetles, Dried Fruit Beetles, Drugstore Beetles, Firebrats, Fleas, Flies, Gnats, Grain Mites, Granary Weevils, Indian Meal Moths, Lice and eggs (on clothing, bedding and furniture), Meal- worms, Mediterranean Flour Moths, Mosquitoes, Moths, No-see-ums, Pillbugs, Red Flour Beetles, Rice Weevils, Saw-toothed Grain Beetles, Silverfish, Sowbugs, Spiders, Stable Flies, Ticks, Trogaderma, Wasps, Waterbugs, Weevils and Yellow Jackets. WHERE TO USE IT: Inside homes on furniture, chairs, couches, bedding, cracks and crevices and all other places target pests may be living or nesting. RATE OF APPLICATION: A can is enough to treat several rooms and since you control the spray you can use it many times over several days or use it all if you are treating a large house. I seem to have black flies in my old house that I am renting in Cleveland, Ohio. We have had a lot of rain. I want to buy products to kill these flies, but the product must be safe to use arounds pets as I have a French Bulldog. What do you recommend? I have wasps building nests under the deck of my pool. 9 nests found so far. The pool is 16ft by 24ft and 4ft tall. How much product would I need to apply and how often would I need to apply it? Also, does it need to be re-applied after a rain? PT-Microcare is generally used to "repel" wasps from air spaces but not for directly treating nests. So lets say you've noticed wasps around a patio or deck where you and your family would like to sit after dinner or during a barbecue. To keep wasps away from this area, you would apply Microcare by walking around using it as a "space spray" to the open air. Basically moving about using a slow walking pace you would want to apply 15-30 seconds per 25 ft by 25 feet of ground space. You'll want to do the application "upwind" as much as possible to so any breeze present will help by carrying the treatment into the zone you want to protect. 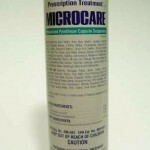 Now since Microcare uses pyrethrin as its active, you can use it 30-60 minutes before anyone is going to sit in the area to achieve the best results. But pyrethrin doesn't provide a residual so after a day, the treatment will be gone. For this reason you'll want to use it just before you want to go out in the area and not have wasps active. So with that being said, it should now be clear that Microcare is not what you'd want to use to treat wasp nests. But if you review our Wasp Control article, you'll learn about what options are best suited for this task. Personally I like to use the Drione where possible. It works immediately, lasts a good long time and its is easy to apply even when nests are hidden like under a deck. Just puff some out through any visible entry ways and cracks you see the wasps passing and you'll quickly kill them off. Now if they're landing where you can see nests forming, like on the bottom side of deck, directly treating these nests with Cypermethrin can also work. But this approach is best only if you have see the nests and you're sure you can reach them. For hidden nests, Drione does a better job of reaching them in cracks and crevices because of its natural "smokey" design. The good news is both Drione and Cypermethrin will last for weeks. And though rain will wash them away over time, you don't have to treat after every rain. At worse, treating twice a month will usually do the job fine but once the wasps are under control, using either Drione or Cypermethrin once a month will prevent new nests and all other insect/wasp activity. Our home had an 'invasion' of gnats. They were very bothersome. We tried 'over-the-counter' bug sprays which were ineffective. The 'Micro-Care' was helpful in eliminating the gnats. We have used it twice and will need to use it once more to completely rid our home of these pests. Great at answering my question regarding best product for my situation, and prompt shipping. Thanks and the Microcare has done the trick.